Abdelfettah Elkchirid joined Wilfrid Laurier University in 2015. 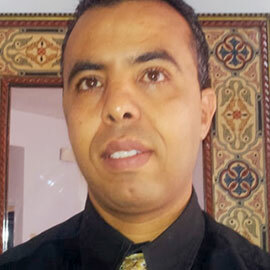 Abdelfettah Elkchirid holds a Master’s Degree in Social Work (2007) and a Ph.D. in Social Work. His teaching experience and interests include: structural approach to social work in direct practice and international social work; social work practice with individuals, groups and families; social work with involuntarily-assisted individuals; social work with groups; and cultural diversity. His research interest focus on cross cultural social work practice, international social work, and social work practice with survivors of trauma and torture. The main focus of my research is cross cultural social work practice, international social work, and social work practice with survivors of trauma and torture. I am currently involved in developing two research projects. A research project on developing a guide to implement Men's support groups for refugees, and a research the intersection of gender, culture and past migration experience on returning Moroccan female migrant farm workers from Spain. International Institute of New Jersey: Employee Recognition Award (2007). Monmouth University: Community Engagement Award (2008). Division of Mental Health of the State of New Jersey: Community Development Award (2009). Meaning of healing from an Aboriginal perspective. Proposed Charter of Values in Quebec as an example of cultural conflict. Elkchirid, A. (2012). “Multicultural Competencies for Community Counselors.” The African Journal for the Psychological Study of Social Issues, 15 (2), 393-410. Elkchirid, A. Reitmanova, S. Issues and Advantages of Applying a Religiously Modified CBT to Muslim Clients Dealing With Scrupulosity. Submitted to Transcultural Psychiatry. McGill University, Montréal, Canada.